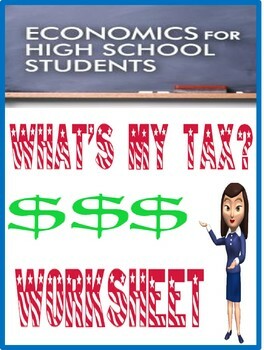 High School Economics What's My Tax Worksheet helps students analyze taxes in their state and provides helpful websites to use. Can be used for homework, supplemental to a lesson, or for a sub day. As such, it is for use in one classroom only. This item is also bound by copyright laws. Redistributing, editing, selling, or posting this item (or any part thereof) on the Internet are all strictly prohibited without first gaining permission from the author. Violations are subject to the penalties of the Digital Millennium Copyright Act. Please contact me if you wish to be granted special permissions!